So now that everyone knows the components of a bed, we can talk about putting it all together into a scrumptious mass of comfort and relaxation. The first thing you want to remember is that if you always want your bed to be nice and clean and inviting, you have to make it everyday. Nothing makes your bedroom more untidy and stressful than an unmade bed. The inimitable Jolie Kerr runs a bed making challenge every year and every year more people are converted to the joy that is a nicely made bed. This is also great advice for a guest- make the bed everyday and make a marvelous impression on your host. To make a nice bed, you take your mattress and cover it with either a topper or a mattress pad, or both! Then put your fitted sheet (that’s the one with the elastic in the corners) on top of that. 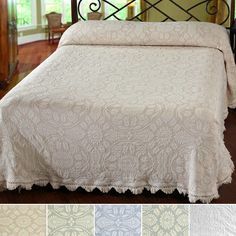 The lay your flat sheet over that (if it’s printed, put the printed side down as that is the “nice” side of the fabric and then you are enveloped in the nice parts of your sheets!) and tuck in the bottom corners (hospital style or whatever is easiest for you). Then put blankets, if you are using them, over that. 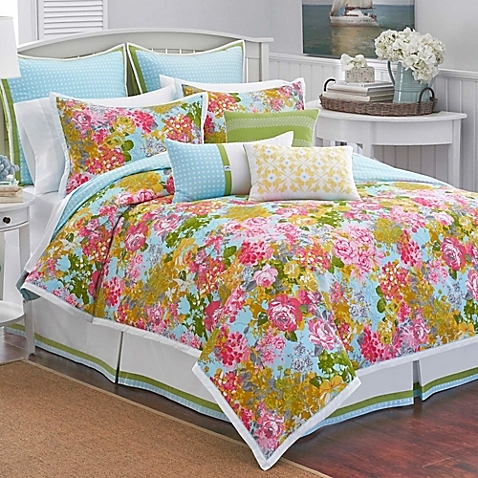 The next step is to put your pretty comforter/duvet/bedspread/quilt/coverlet on top. There are two main methods of doing this. Lay it flat and then fold the top third backwards, place your sleeping pillows on the fold, and then fold the spread back over the pillows. This is what you frequently see in older motels since it was pretty popular in the 50s/60s/70s. It obviously works better with a flatter spread like a quilt or coverlet. This is a good option if you don’t want to bother with shams or decorative pillows but you still want to disguise your drool-covered and sweat stained sleeping pillows. Once your have your covering on, you need to put your pillows on. There are also two methods for this. You can lay your sleeping pillows flat, like you sleep, and put sham pillows (or not) on top of them, like pancakes. Or, you can do what pretty much all bedding stores do and put the sleeping pillows vertical, leaning against the headboard or wall and put the sham pillows in front of them. Then you can put your throw pillows in front of all that. Wash your sheets once a week or at max once every two weeks, as a rule of thumb. Always wash guest sheets between guests. When you are a guest, ask your host what they want you to do with your sheets at the end of the visit. Don’t assume they want the bed made up with dirty sheets OR that they want you to strip it. Of course, if you wish to sleep in a rats nest of unwashed, unmade sheets, that’s pretty much your business.